Posted on November 27, 2017 by Loudspeaker Films presents TEACHED and filed under Screenings, Support Us, TEACHED Films, Updates and tagged TEACHED eclipse education indie film film festival Loudspeaker films. There are now quite a few ways to watch or screen the TEACHED short films, so we thought we'd make a quick list to make sure you are maximizing the options, most of which are very low-cost if not free (we want everyone to be able to access these films). Also be sure to sign up for our mailing list (on the home page) to get news about new films and screening dates. KANOPY. Over 3,000 universities, colleges and libraries subscribe to this awesome service, which makes viewing FREE for their students, professors and members. VIMEO-ON-DEMAND. We love Vimeo for its high-quality content and presentation. You can rent or buy the TEACHED films here to stream any time without ads. TEACHED VOL. I (The Path to Prison, The Blame Game and Unchartered Territory) and the short film Code Oakland are available on DVD. Go here. ll five of the current TEACHED short films are available for screening at events, your workplace, faith-based institutions, etc. Go here to get started. Keep an eye out for our presence at film festivals (around the world!) and at conferences and special events on our find a screening page. Posted on February 16, 2017 by Loudspeaker Films presents TEACHED and filed under Screenings, TEACHED Films, Updates and tagged TEACHED kelly amis Loudspeaker films unchartered territory the blame game code oakland think of calvin the path to prison. We are happy to announce that our first three short films, TEACHED Vol. I, are now available for streaming on Vimeo-on-Demand! We made these films because we believe that more people need to understand how and why we still have a race-based "achievement gap" in the U.S. More people to understand the consequences of inaction especially for low-income urban youth who are hit hard by our failure to provide every student with an excellent educational experience. Posted on March 9, 2016 by Loudspeaker Films presents TEACHED and filed under Education Equality, TEACHED Films, Screenings and tagged the path to prison the blame game the atlantic unchartered territory KellyAmis Pearl Arredondo charter schools harlem village academies friendship schools chavez charter schools howard fuller irasema salcido steve barr school discipline education education equality urban education. Code Oakland will screen three times at the Napa Valley Film Festival. Go HERE for screening dates and times. Posted on October 22, 2015 by Loudspeaker Films presents TEACHED and filed under Screenings and tagged nvff code oakland black girls code #YesWeCode qeyno napa valley indiefilm kelly amis. Our newest film, Code Oakland, is already getting into film festivals not just around the U.S., but the world! We have screenings coming up in St. Tropez, Canada and even one in India (not on the list yet -- stay tuned for those details). Meanwhile check out the dates for the Art of Brooklyn, Julien Dubuque, Humboldt Internat'l, "(In)Justice for All" in Chicago and more. Go to our screenings page for dates & details. Also, if you're in the Bay Area, save the date of May 9th, 6:30-8:30, for a very special screening of Code Oakland at Impact Hub Oakland! Details coming soon. Posted on April 10, 2015 by Loudspeaker Films and filed under Screenings and tagged code oakland black girls code black male achievement kimberly bryant Kalimah Priforce van jones yeswecode teached Loudpeaker Films brooklyn oakland indie film Documentary FIlm KellyAmis. Thanks to React to Film, NYCAN & its Exec. Director Derrell Bradford, the Museum of the Moving Image and the staff of Loudspeaker Films, we had a fantastic premiere screening of Code Oakland in NYC. Read the details here, the press release here and watch the student presentation and panel discussion HERE. Our Producer/Director Kelly Amis and Code Oakland film star Kalimah Priforce also got to join React to Film in ringing the Nasdaq bell! Thank you to React to Film founders Dennis and Coralie Dennis for this amazing opportunity. Posted on March 19, 2015 by Loudspeaker Films and filed under Screenings, TEACHED Films and tagged react to film qeyno kalimah priforce kelly amis loudspeaker films nycan derrell bradford museum of the moving image. NOW POSTED: PHOTOS & VIDEO FROM THE CODE OAKLAND PREMIERE! Check out the PHOTO GALLERY and a great video our intern Vanessa made from the event: Code Oakland Premiere Party. Please join us for the premiere and celebration of Code Oakland, a new TEACHED short film by Kelly Amis. The evening will include a performance by local girls band Sisters Keeper, music by DJ Oracle, and a chance to meet the stars & director of Code Oakland. It is brought to you by West Wind Artists, Youth Aid (both founded by performer & music producer D'Wayne Wiggins) & Loudspeaker Films, and is generously sponsored by the Kapor Center for Social Impact, the Salesforce Foundation and the Port of Oakland. We'll have scrumptious food (including veggie options), a hand-crafted cocktail created by local mixologist Danny Ronan, delicious organic teas provided by Numi and tastings of fine wines from Clos Pegase, the Clif Family Winery, Cal Vin & Hocks and other generous donors. This is an invitation-only event; please RSVP by Jan. 27th. Parking is limited: please use public transportation, a ride service, taxi or carpool. The nearest BART station is Coliseum. You can walk from there (10 -15 min.) or grab a taxi to Mindseed SoundStage. Posted on January 28, 2015 by Loudspeaker Films presents TEACHED and filed under Screenings. We are proud to be presenting TEACHED and our interactive screening model at this year's Black Alliance for Educational Options (BAEO) Symposium being held in New Orleans. We will be showing clips from our films and talking to the Emerging Leaders of BAEO's Bailey-Sullivan Leadership Institute on how to organize communities and advocate for educational equality using our short films. BAEO’s Annual Symposium has convened for 14 years to inform, inspire, and empower emerging leaders (age 16-35), parents, educators, elected officials, community leaders, and clergy from across the country as they work to increase access to high-quality educational options for Black children by actively supporting transformational education reform initiatives and parental choice policies and programs that empower low-income and working class Black families. The Symposium remains the largest gathering of Black education reform supporters in the nation, drawing as many as 1,000 participants.
. 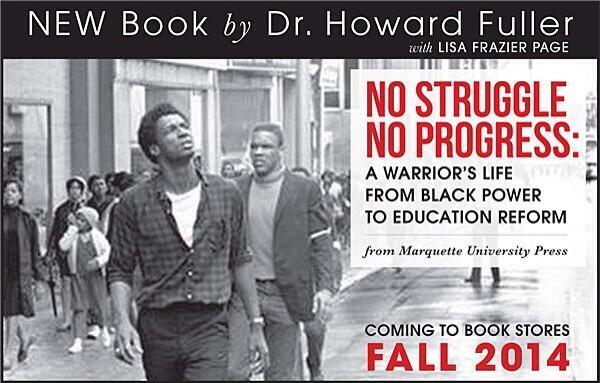 He has also just announced the publication of his new book "No Struggle, No Progress" coming out in the fall. We send our congratulations and can't wait to read it! Posted on March 17, 2014 by Loudspeaker Films and filed under Screenings and tagged BAEO BAEO Symposium Dr. Howard Fuller Howard Fuller No Struggle No Progress TEACHED KellyAmis. We are thrilled that TEACHED Vol. I will be screened at the innovative SXSWedu Conference and Festival in Austin, Texas this year. Pearl Arredondo is an amazing teacher and star of our film The Blame Game: Teachers Speak Out, who received much acclaim for her candid Ted-Ed talk last year. Pearl grew up in East Los Angeles, the daughter of a high-ranking gang member. Explaining that she was written off by teachers when she was a student, Pearl is now inspiring both other teachers and students with her work as the founder of a teacher-run pilot school and education advocate. RiShawn Biddleis the Publisher and Editor of Dropout Nation, a website of commentary and analysis of American public education that is required reading for anyone who believes in education equality for all children. An acclaimed reporter and current columnist with The American Spectator, RiShawn now has over 20,000 unique readers visiting Dropout Nation each month to learn about the policies and practices that contribute to the achievement gap, the depths of our nation's dropout crisis and related issues including juvenile justice. Adrian Fenty, recent Mayor of Washington, DC, has much to be proud about for the reforms he ushered into a long-dysfunctional and failing education system, reforms that have proven effective and are still evolving today under Mayor Vincent Gray and DC Schools Chancellor Kaya Henderson. On his first day as mayor, Adrian introduced legislation to assume control of the public school system; once approved, he brought in founder of The New Teacher Project Michelle Rhee to serve as Chancellor. Together, they pursued a difficult but necessary reduction of the system's central office staff and underused school facilities as well as a new performance-based compensation plan for teachers. Kalimah Priforce runs Qeyno Labs, which works with local schools and partners to make "career day" an everyday experience for the millions of students that cannot afford private college and career guidance. We hope to see you in Texas with plenty of questions for our esteemed panelists. For more details about our screening event at SXSWedu go HERE. Posted on February 19, 2014 by Loudspeaker Films and filed under Screenings and tagged 2014 Adrian Fenty Documentary FIlm Dropout Nation Kalimah Priforce Pearl Arredondo RiShawn Biddle SXSWedu TEACHED TEACHED Vol I eduFILM KellyAmis.